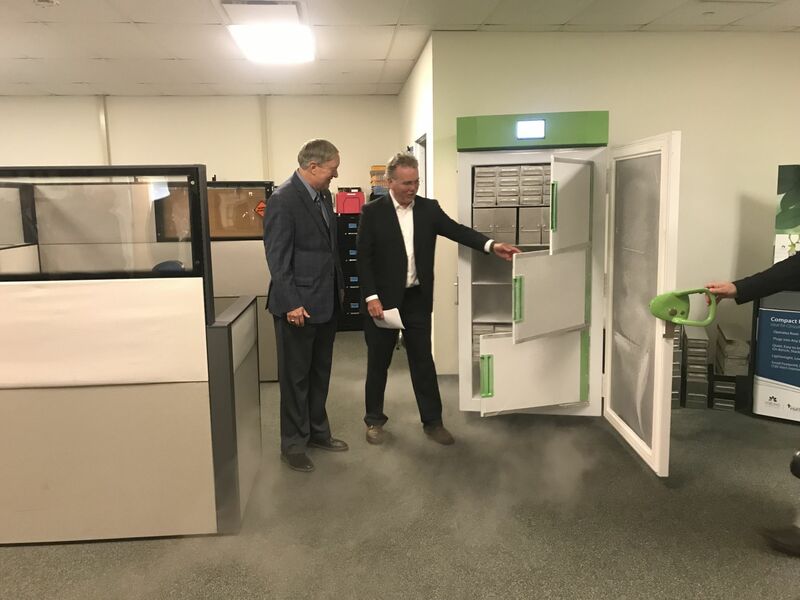 Ohio University President Duane Nellis, left, observes as Global Cooling, Inc. CEO Neill Lane presents the company’s ultra-cold refrigerator. In an effort to learn more about businesses and institutions in Athens and Hocking counties, Ohio University President Duane Nellis spent the day Friday touring two businesses, along with Hocking College and non-profit Stuart’s Opera House. Nellis met with owners and operators of the sites he visited to discuss their contributions to the community as a whole, and their relationship to the university community. First on the university president’s itinerary was a tour of Global Cooling, Inc., “one of TechGROWTH Ohio’s regional success stories,” according to the release. The TechGROWTH Ohio program is part of OU’s Voinovich School of Leadership and Public Affairs. CEO of Global Cooling Neill Lane acknowledged before the tour that the company’s work with TechGROWTH has had a significant positive impact on the business. 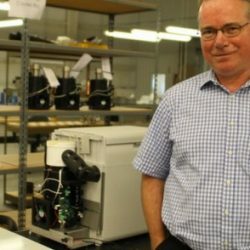 Lane explained that the company, located near The Plains, has seen tremendous growth in the last couple of years and is now the fifth largest manufacturer of ultracold refrigerators in the world. “Success has many parents… but Ohio University really has been there from the beginning,” Lane said. The company has had help writing at least one grant from the Voinovich School, Lane continued, and has received money from the Ohio Innovation Fund, to which the university has contributed greatly, along with Ohio State and Kent State universities. Nellis said OU has invested $15 million into the fund. “It’s an amazing company,” Nellis said of Global Cooling. “I speak about it often, and it’s one of those points of pride” for the community and the university. Lane explained how the company’s products are handled, how they’re utilized, and what sets them apart from others on the market before guiding Nellis back to the production area, where Chief Operating Officer Tim Dannels explained some of the company’s processes and procedures.